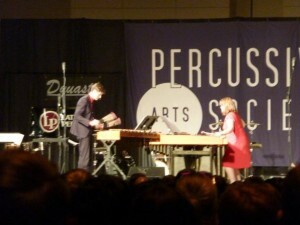 Dr. Hinkle performs at PASIC 2010! Dr. Lee Hinkle was a featured performer at PASIC 2010 with Janis Potter’s All-Star Mallet Ensemble. The group featured stalwart percussion industry names such as Mark Ford, She-e Wu, Chris Hanning, Lalo Davila, Julie Davila, Anders Astrand, William Moersch, and Joseph Gramley. The performance included several world premieres including the world premiere performance of a new marimba duo by Nicholas Wheeler entitled de Falla Fantasy performed by Dr. Hinkle and Janis Potter. UM Percussion Day a great success! The UM Percussion Day on Saturday October 23 was a great success! Over 40 participants from local middle and high schools joined us for a day of All-State audition music preparation and a marimba masterclass presented by Janis Potter. UM faculty Jauvon Gilliam, Tony Ames, and Dr. Lee Hinkle were joined by Janis Potter in coaching the All-State preparation session. 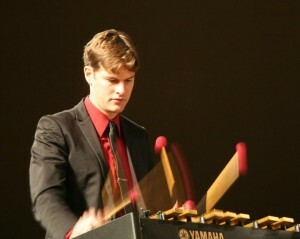 UM percussion students Robby Bowen and Keith Williams performed marimba works for Janis Potter. Thanks very much to everyone who participated in this wonderful event! All events are FREE but please RSVP! And special guest Janis Potter! 2:00 pm – Marimba Masterclass with Guest Artist Janis Potter! Janis has performed more than 250 recitals and has presented masterclasses at more than 50 major universities as well as five Percussive Arts Society International Conventions. She is best known for her unique and ground-breaking transcriptions and arrangements which have pushed marimba solo literature to a new level. This masterclass will focus on the multiple timbres of marimba as well as unusual playing techniques such as dampening and specialized rolls. Students will also be invited to play solos and participate in group exercises. Janis is sponsored by Dynasty and Innovative Percussion. Please RSVP if you would like to join us for this exciting day. Indicate whether you would like to play for the all-state prep session and / or the marimba masterclass. All are welcome! For more information, check out our new Percussion Website!